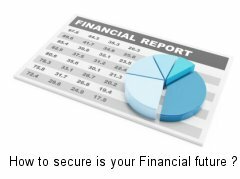 How to secure is your Financial future ? Home » Personal Finance » How to secure is your Financial future ? Every one knows that what is meaning of future (things which will come at later part of life). Financial future means what will be your economic situation in future. This question may be there in every one’s mind that how healthy/secure their economical situation will be at later part of life? Answer of this question will be given by either you or by financial expert who in turn sees your goal, amount and pattern of investment in investment instruments. Proper analysis of your financial portfolio is to be done in order to know that your financial future will be secured or not. You need to provide following inputs. From above question one will come to know your current financial health. In short one has to know your current asset, current liabilities, income and your investment patterns in various assets in order to do further analysis. This in broad term is known as portfolio analysis. It is a generally accepted principle that a portfolio is designed according to the investor’s risk tolerance, time frame and investment objectives. There are several methods for calculating portfolio returns and performance. This type of analysis helps you in order to know your financial future. In this article it is depicted that one should note down his/her details about income, expense, investment and liabilities. With specific risk and return based analysis one can get answer that his/her financial future is secured or not. Peer 2 Peer lending is risky option and it is advisable to thoroughly check all details of client before lending your money.